October 16, 2012 – Greater Toronto Area REALTORS® reported 2,961 sales through the TorontoMLS system during the first 14 days of October 2012. The number of transactions was down by 10.5 per cent compared to the same period in 2011. New listings were up by 5.5 per cent year-over-year to 6,505. “Some households have put their home purchase plans on hold in response to the higher cost of home ownership brought about by the recent changes to mortgage lending guidelines. Both first-time buyers and existing home owners have been affected, given that sales were down across house types and geography,” said Toronto Real Estate Board (TREB) President Ann Hannah. The average selling price for sales reported from October 1 through October 14 was $501,146 – up by almost six per cent in comparison to last year. “The average selling price grew well above the rate of inflation in the first half of October due to relatively tight market conditions from a historic perspective. However, the market continued to become better supplied, pointing toward a slower pace of price growth as we move into 2013,” said Jason Mercer, TREB’s Senior Manager of Market Analysis. 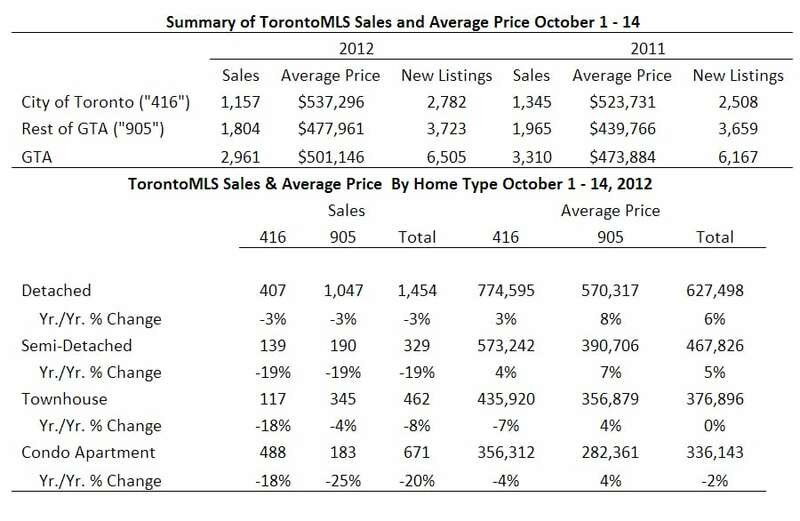 September 2012 GTA Realtors® Release Mid-Month Resale Figures Client Appreciation 2012 It’s Coming!